Calligraphy is an art form, but is it possible to learn calligraphy for free? We understand that sometimes, jumping into a hobby feet-first can be a little intimidating for some people. Some people find it easier to read a book about it, try it out and if they take naturally to it, then maybe they'll start a class or join a group to get better or progress. For those of you who would like to try your hand at learning calligraphy, we've put together a guide, that will help guide you to the point where you feel ready to carry on your learning journey. You don't want to splash out on endless nibs and inks and paper when you have no idea what you are doing, so start with the basics and work your way from there. Rhodia Dot Calligraphy Practice Pad is perfect for modern calligraphy practice, Rhodia paper is smooth and strong but great for tracing over guides too. Modern Calligraphy: A Step-by-Step Guide Book. This book is a bible for those who are looking to start calligraphy. Written by the masters at Quill London, this step-by-step guide is simple, easy to follow and effective in teaching modern calligraphy to an extent. We are aware that this guide promised calligraphy for free, and we've just listed a £30 shopping list for you to splash out on. If you are lucky enough to already own everything you need for your calligraphy journey to begin then you can skip this step. But if you are looking to learn calligraphy, with just a pen and paper, we've got a little sneaky trick that can help you fake calligraphy. Now we must stress, this is fake, and it isn't learning the skill of calligraphy, it is just mimicking it. But if you're wedding budget is spent, and you've still got name place cards to do, this is the perfect solution to all your woes. It's fairly simple to fake calligraphy essentially. In calligraphy, you put pressure on the nib on the downstrokes so that they are thicker than the rest of the letters. To fake calligraphy, you just need to write out a word in your most beautiful cursive handwriting, and then add a thicker line to the downward strokes afterwards. It's easier to draw the outlines first on where you would like the letters to be thicker, and then clour them in. You can do this with any pen, but a classic fine line is probably best. Follow this step-by-step guide on how to fake calligraphy on I Try DIY. Fake calligraphy looks a little like the picture below. Once you've got the gear, where do you begin? So if you've got all you need, you've bought your calligraphy supply kit, and you've had a go at faking it while you waiting for them to arrive. This is the section you need to read up on next. We have to admit, to learn calligraphy at home, for free, can be very tricky. Instagram can be a great place to start when it comes to finding inspiration. We have a few favourites to follow including Smitten with Ink, Alice Gabb, London Calligraphy, Babooche and Kirstie Bird. The best place to find free calligraphy tutorials is of course YouTube. Some of the best calligraphy channels include AmandaRachLee and How to Hand Letter. These channels are full of tips and tricks on lettering. The problem is with modern calligraphy nib and ink style, you can't really learn it from a video. It's difficult because you need to be aware of your posture, the way you are holding the pen differs from person to person and you will inevitably make mistakes. In a tutored calligraphy lesson, your teacher will be able to tailor the lesson specifically for you, whether you are right or left handed (makes a huge difference) and be able to guide you along the way. Definitely, for first-timers, YouTube can be a treacherous ground, and you'll find yourself frustrated more than anything. 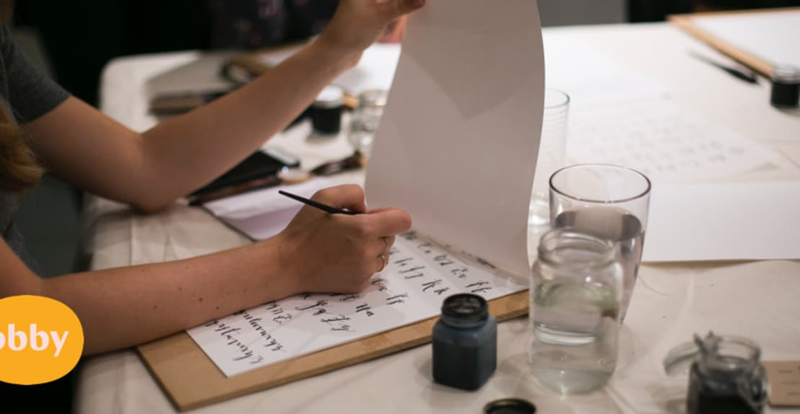 If you'd like to try a class in person, check out the range of calligraphy classes on Obby. Use Obby to find a calligraphy class. We are on a mission to rethink learning. Working with trusted and passionate teachers in inspiring places, Obby is reshaping the way we think about education. Imagine a calligraphy class in a beautiful venue. You walk into the room and you are greeted with a cake with a frothy flat white. The crockery matches and the music playing is soothing your soul already. You are welcomed by a warm and friendly teacher host, who shows you to your seat all laid out with your personalised calligraphy starter kit. Obby is providing all our education dreams, as a reality. Our calligraphy teachers are super talented, with some of them designing window displays for Jo Malone and others writing place cards up for the Royal Wedding. We make a habit of finding the best teachers in the country, so you don't have to. Check out our full range of calligraphy classes to find the one nearest you.